Crocodiles live in rivers, lakes and dams in parts of America, Asia, Africa and Australia. 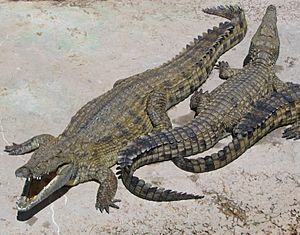 Some of the crocodiles from Australia live in salt water. These saltwater crocodiles are normally bigger than the ones that live in fresh water. While crocodiles spend most of their time in water, they can come out and move around on the land. Crocodiles cannot breathe underwater: they breathe air, just like people. They can hold their breath for a maximum of about two hours underwater. Some people feel threatened by crocodiles because they can be violent. However, some people find them fascinating. Specimen of skull (upper view) prepared by the bone maceration technique. Statue of Sobek from the mortuary temple of Amenemhat III. circa 1810 BC. Ashmolean Museum, Oxford. Crocodile Facts for Kids. Kiddle Encyclopedia.